Book DescriptionFor many years, Nimzovich was known as the "Stormy Petrel" of the chess world. Today, his profound theories of positional chess are accepted as a matter of course, and a knowledge of them is essential to every player who wants to improve his game. My System describes a theory of chess; it also describes the character and genius of its author. It is a very readable book, for Nimzovich's methods sparkle with humor, pungent originality, and witty explanations. This is the all-time chess classic of Aron Nimzowitsch, now provided in algebraic notation and updated to modern understandable English. One of the three or four best selling chess books of all time. Contains 419 diagrams. Recommended by Grandmasters and masters for 75 years! Completely modernized in this 1991 edition. 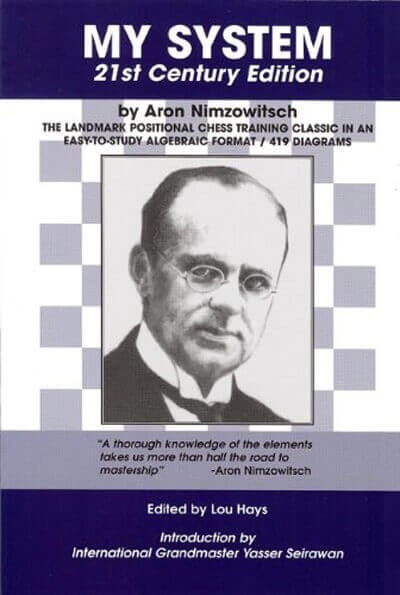 About the Author: Aron Nimzowitsch was one of the world's strongest chess Grandmasters in the early part of the 20th century. He wrote several classic chess books which have been best sellers since the 1920s. His books are highly recommended by chess masters the world over.